LONG BEACH, Calif., April 1, 2014 –Dance with the local muse by celebrating Elemental Long Beach, an upcoming Hellada Gallery exhibition and recently published chapbook. Ten paintings by Tom Schershel and ten poems by Laurie Zupan are the result of the collaboration between the artists and the local elements, earth, water, air, and fire. The Belmont area neighborhood's Veteran's Memorial Pier and the famous feral parrots are examples of two icons that inspired the artistic and poetic imagery. All of the paintings are acrylic on canvas and represent a range of representational and abstract styles. The poems are free verse and reflect humanistic and nature themes. Tom's paintings have been published in the inaugural issue of Subprimal Poetry (http://subprimal.com/issues/issue1). Tom and Laurie also collaborated to create a visual and poetic representation called "Totem". 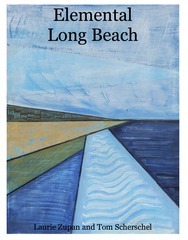 All of the works in the exhibition can be found in a chapbook also entitled Elemental Long Beach published by Redbird Chapbooks (redbirdchapbooks.com). Tom can be contacted at tom.craig@yahoo.com. To find out more about Laurie, go to LaurieZupan.com. Opening Reception and the book signing is Saturday, April 5th, 6-9pm.